I remember when I first learned about The Burning Sky nearly a year ago. 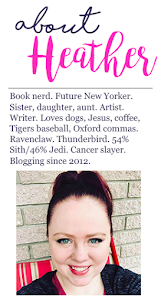 A blog tour company that I was with at the time was searching for bloggers to read and review it for a tour, of course, and I applied, but because I was still so new, I wasn't accepted. But I did end up purchasing the book for my Nook and I kept it on the back burner for awhile. Anyhow, it was one of those books that unfortunately, I just kind of forgot I had and that got lost in the shuffle between treatment and then suddenly being requested for lots of other reviews and tours. But while I was in NYC, its sequel, The Perilous Sea, came up for review on Edelweiss, which I was auto-approved for, so I decided to download it and started in on The Burning Sky in mid-June. I want to start about by saying that I liked The Burning Sky very much. I think it's a really fun, entertaining, great read. And I'll get to all the phenomenal parts about it soon, but I can't get to them without delving into a few of the faults I found. This is going to sound like a downer review at first -- but I promise it isn't. I've given the book four hearts! And you'll see why. But here are the few little downer tidbits first. First, I felt like the comparisons to Harry Potter were spot on, but not because it is similar in nature, deals with a similar subject matter, or evokes the same kinds of emotions. The comparisons were accurate because so much of the beginning reminded me of Harry Potter. The main character, Iolanthe, is a girl who is orphaned and who her caretaker has taken great pains to hide. She is what is considered to be an Elemental Mage, in that she can manipulate the elements (earth, water, and fire, specifically, when the book begins). This makes her rare and coveted -- it is unheard of for Elemental Mages to be gifted in that many elements. There was also a prophecy told that was in regards to her and her possibilities. In the very beginning of the book, we are introduced to a concept called "vaulting" which is essentially the transfer of one's person to another location by magic -- essentially apparition, though it seems it takes time to master it and too much of it can make an inexperienced mage sick. There are also some characters that bring to mind some Harry Potter counterparts. For example, there is an Inquisitor who reeks of Dolores Umbridge (and her title certainly lends to that). And there's a woman by the last name Dawlish, a perhaps unintentional allusion to the auror Dawlish. The way the world is constructed is similar, too. Some people consider this to be a high fantasy book, in the leagues with the Graceling Trilogy or the Grisha Trilogy. I do not. Those books have established a world and that resembles nothing of the world we live in, where Iolanthe, Titus, and the cast of characters live is a world within our world. Hidden, just barely, by mages who are really running the world's show and just allowing those non-magical humans to believe that they have control. None of this was done badly -- it was ALL well-written. But I wasn't as fresh as I'd hoped -- at least not at first. But despite all this, I kept reading because I just had a feeling that even though all these things were so similar at the beginning and didn't feel very unique, I really like Iolanthe, the elemental mage, and I thought she was very compelling, interesting, and easy to relate to. I found her fascinating. And I loved the world that was slowly being crafted by Sherry Thomas. 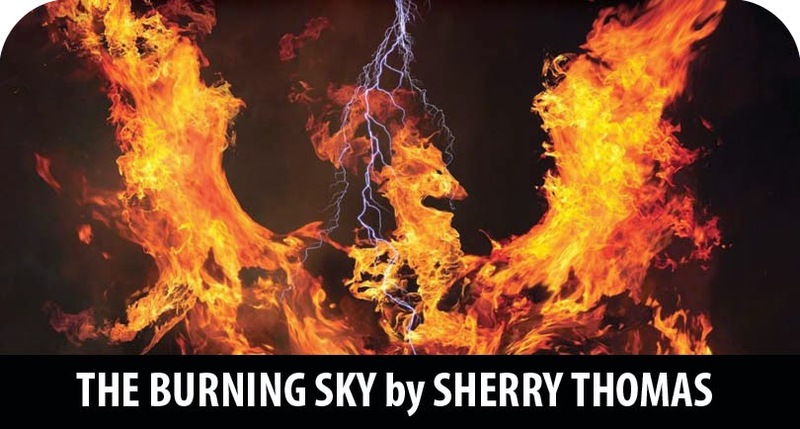 Really, despite my initial concerns and misgivings, Sherry Thomas really came through with The Burning Sky. It was very interesting, the plot kept me on the edge of my seat, there was a lot of mystery to it, and I realy loved all the characters. I think that one my favorite parts is that for a time, Iolanthe has to disguise herself as a boy so she can blend into at the boys' boarding school that Prince Titus attends and so he can protect her. She plays a very convincing and charming guy, and I loved Titus's reactions to her. At the beginning of the book, I felt Iolanthe was a little whiny and also was a little annoying. But I watched her evolve immensely throughout this story. I loved seeing that change in her. Sherry really depicted her growth well. And I loved seeing Iolante embrace her power as opposed to being afraid of it. Because of this, she eventually learns to master the other element that hat alluded her -- air. Another favorite part of this book for me is The Citadel, a device that allows Titus and Iolante to transfer into what is essentially a land of multiple fairy tales that can be used for practicing fighting, creative problem solving, and figuring out riddles. It was so unique. And it brought an added element of fairy tale retelling to the story, which is one of my favorite things when done well -- and Sherry Thomas did it so, so well. I loved that there were these stories within a story. And that it could also be used as a transport device. It was so, so unique. It fused so many things that I loved together. So for all the little similarities I took notes of at the beginning, they really didn't matter. Because a couple of chapters in, I totally forgot about them -- I even forgot to take notes about the rest of the book because I was so engrossed and loved it so much. 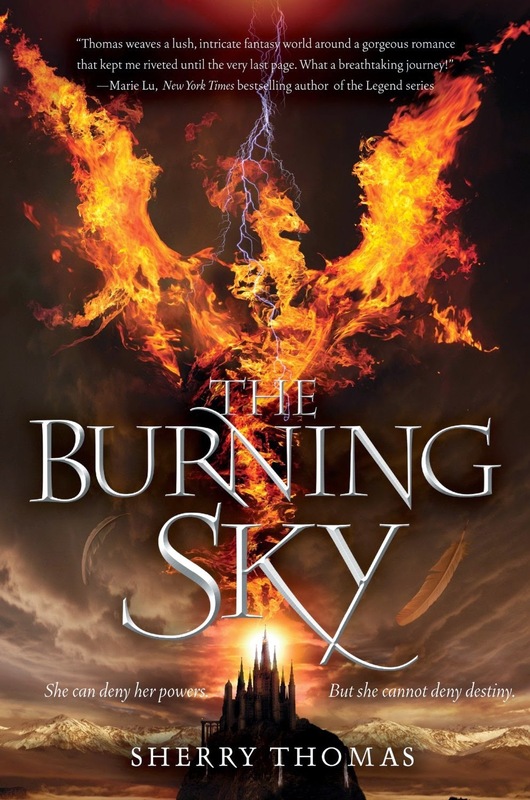 The Burning Sky was a great read and if you do enjoy books with magic, then you'll love this. And commit to it for more than just a few chapters. It's so worth it and the story is just so fun and awesome. The second book, The Perilous Sea, releases on September 16 and I will have the review here September 15.